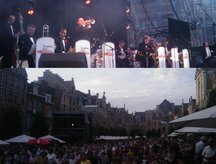 On four Fridays in July the historic part of the Belgian town Leuven becomes one big open air festival (Beleuvenissen). Friday July 3rd was the first festival day and the theme was 'Jazz'. The Pasadena Roof Orchestra performed on the stage set up at the 'Oude Markt' and wowed some 6000 people who enjoyed the music, the weather and drinks at one of the many outdoor bars and street cafés. Seven stages are spread throughout the inner city forming the venues of this very well-organised festival. Leuven is famous for its university - the oldest in Belgium -, its numerous breweries and many superb examples of the Flemish architecture. It will certainly be one of the highlights of the Orchestra's summer 2009 appearances.